Ok. a positive update. Customs have allowed them in. But with a weird departure procedure. Thanks for offering to help or just feeling frustrated for us. Good news, but we would of had some extra pink jerseys for your team in case! Ouch! Glad to see that this worked out for you guys! Hello everyone! not long now! 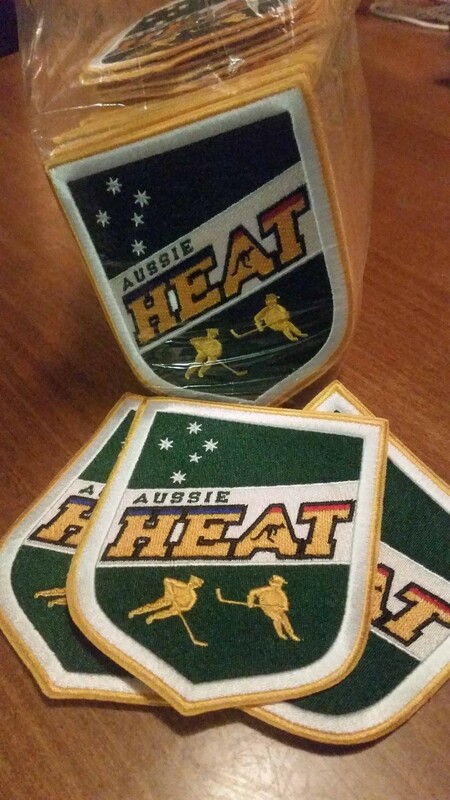 The Aussie heat have just received our teams trading patches, they have turned out great! If any other teams want to get some made i can recommend the supplier I used in china. Paypal payment. 10 days turnaround time. Pm Me if you want to know. If not, we are looking forward to trading with the patch fans out there! Brilliant! Please let me have one! Please send me the info..... Might have to order this week! Novice Division Jerseys. What is everyone wearing? Hello all, I'm in the Process of organizing our team jerseys. As we haven't competed since the 2007 games. I don't have much of an idea of what colors etc you all step onto the ice with. Id love to see pics of what you have! Attempting to get a Multi-agency Australian Ice Hockey team to Fairfax 2015.